Several friends of Sheldon's join host Frank Stasio to talk about his legacy, consider the legacy of The Internationalist and to remind us of what Chapel Hill used to be. Bob Sheldon moved to Chapel Hill, North Carolina from Colorado in the late 1970s and by 1981 he had opened The Internationalist Reading Room. By 1991, the Internationalist was a bookstore and Bob Sheldon was dead. His murder remains unsolved. But because of his politics, speculation as to who wanted to harm Bob Sheldon runs rampant. 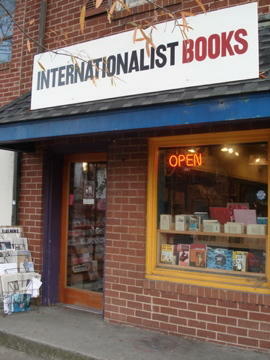 The Internationalist is now a thriving nonprofit and community flashpoint on Franklin Street in the heart of Chapel Hill. The store's journey from reading room to business mirrors Chapel Hills journey from a progressive, affordable college town, to a well-off, sophisticated southern city. The memory of Sheldon lives on as an inspiration to activists and organizers determined to keep the flame of grass roots politics alive in Chapel Hill. Several friends and mentees of Sheldon's – Dan Coleman, William Stott, Andrew Pearson and Andrea Eisen – join host Frank Stasio to talk about his legacy, consider the legacy of The Internationalist and to remind us of what Chapel Hill used to be.